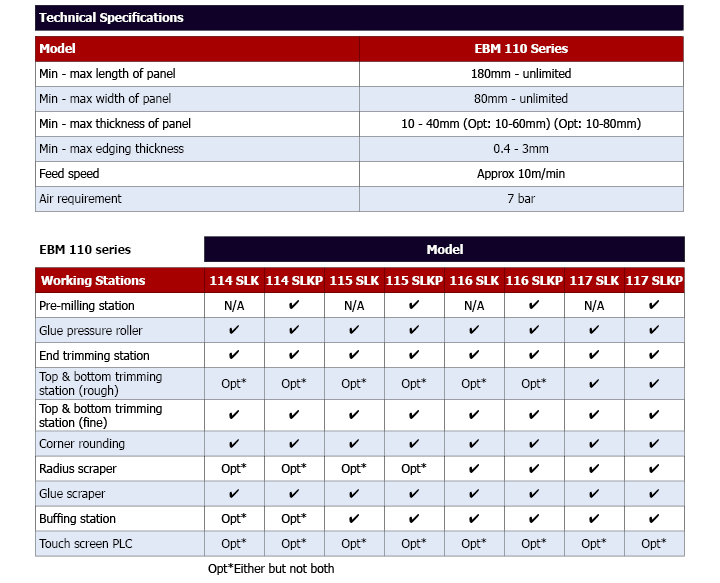 The 110 series from EBM has become the flagship range from this German manufacturer over the past years, and is our most popular selling Edgebander. Customers appreciate the versatility and flexibility of the machine and the outstanding quality of the finished product. Main features include 10m/min speed, rapid heat Teflon coated glue pot (6 - 8mins), fast re-setting time upon changeover of edge material thickness and centralised dust extraction system. All machines feature an extendible panel support to provide stability to large panels during processing. The machines can be specified with a touch screen controller offering the operator the use of 32 pre-defined programmes, and full diagnostic features.